Schaeffer Center Scholar Juan E. Saavedra recently published a book on how to improve education quality in Colombia entitled “Tras la Excelencia Docente” (“In Pursuit of Teaching Excellence”) funded by the Compartir Foundation. Last month, President of Colombia Juan Manuel Santos used the study to announce his vision for the country to become the most educated nation in Latin America by 2025. 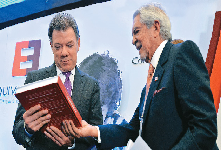 President Santos emphasized that education quality is his number one priority and that the study of Saavedra and co-authors will be the roadmap that he will use to pursue the country’s goals. He encouraged Colombian citizens to rally behind his call to action. Teacher Selection – Recruit the best students and professionals into the teaching profession by providing collegiate scholarships, strengthening entrance requirements and reducing the maximum number of ‘provisional teachers’. Pre-Service Training – Review the requirements and accreditation process for high-caliber education degree programs, improve the filters to create new degree programs, regulate undergraduate training programs, create more teaching degrees, provide support grants for students and reduce the duration of the teaching programs from five years to four years. Evaluation – Improve or create a teacher evaluation system that identifies specific areas of improvement for all teachers. In-Service Training – Accompany new teachers for two years, and offered tailored training based on needs indentured in teacher evaluation process. Compensation and Recognition – Increase teacher salaries to the level of other professionals, such as doctors, lawyers or economists. Increase individual and group bonuses according to performance and service delivery in remote areas. Promote coluntary early retirement of current older teachers through an attractive package. The study also provides details on the costs to government of the program (about .3% of GDP per year, 1.7% of the central government budget), feasible funding sources and different scenarios of expected impacts in the long-run. Saavedra is a Scholar through the Resource Center for Minority Aging Research, housed at the USC Schaeffer Center. Information was taken from an article in Semana, published online at http://www.semana.com/nacion/articulo/fundacion-compartir-propone-ruta-para-mejorar-educacion-en-el-pais/377284-3 on February 15, 2014.